Before heading to the Mad Fox tour, I picked up a brand new coffee stout, called Leaded, on Mad Fox’s half off growler day. On every magical Tuesday, they take 50% off a growler fill from 3pm until 9pm, so you really have no excuse to not stop by. For this creation, Mad Fox teamed up with Beanetics of Annandale, Virginia to get a heavy does of cold pressed coffee (31 gallons of it I believe the tour guide said). I could smell the coffee outside of the growler and in my car as I drove away. I know ahead of time I’m going to be a fan. The growler opened with a huge POP that I was not expecting. The beer pours out a relatively clear brown color, but rests in my glass deep and dark. The head only builds up slightly, but is brown in color and doesn't lace all that much. My guess is that adding the coffee hurt the head retention, but that's a sacrifice I'm happy to make. The aroma is of coffee, wait I think I'm getting some coffee, and oh wait, more coffee. Fresh roasted, the coffee doesn't smell unlike what I drink each morning. There are some roasted malts working their way in as well, with perhaps some fresh hoppiness. I love the smell of coffee, so I love the smell of Leaded. It really tastes like a cup of coffee. I've had my share of coffee stouts in the past, but none were as focused on it as this. You can taste everything from toasted coffee beans, to the grinds lingering on the back of the palate. The roasted malts hang out at the very end, but I don't note any chocolate or hops at all. Medium body with the perfect amount of carbonation I was hoping for. It's so drinkable I'm worried about how much caffeine I'm putting into my system so late in the day. 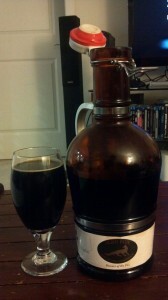 I picked this up on half off growler night...so all 64oz were less than $10. That honestly is a deal I don't plan on ever passing up again. Homerun in my mind. I have been waiting for such a coffee forward stout, and now I have it. Mad Fox puts out a ton of great beers, I'm really lucky to live so close to it. Last updated by Russ Beck at March 11, 2013 . Filed under: Beer, Mad Fox Brewing Co., Stout · Tags: Beanetics, Coffee Stout, Growler, Leaded, Mad Fox Brewing Co.